The dark rosewood Arius YDP-143R from Yamaha is an 88-key digital piano featuring a Graded Hammer Standard keyboard designed to emulate the feel of an acoustic piano, and matte-finished black keys that makes them less slippery when playing for extended periods of time. It has damper, sostenuto, and soft foot pedals with continuous control, and provides playback from two oval speakers and built-in dual 6-watt amplifiers, or two 1/4" headphone jacks with Stereophonic Optimizer technology. The piano allows for selecting between a soft, medium, hard, or fixed touch response to correspond to the performer's individual playing style. The PureCF sound engine powers ten built-in voices that are based on samples taken from the company's CFIIIS concert grand piano. And 192-note polyphony allows many of the most complex piano compositions to be played without any dropped notes, and with sustained notes ringing through faithfully. Two voices can be layered for creating new sounds. A built-in two-track MIDI recorder allows for capturing a performance and playing it back. Using the feature, right- and left-hand performances can be recorded separately at any tempo, and then either hand can be played back by the piano for additional practice. Fifty songs are built in, allowing for additional learning opportunities. 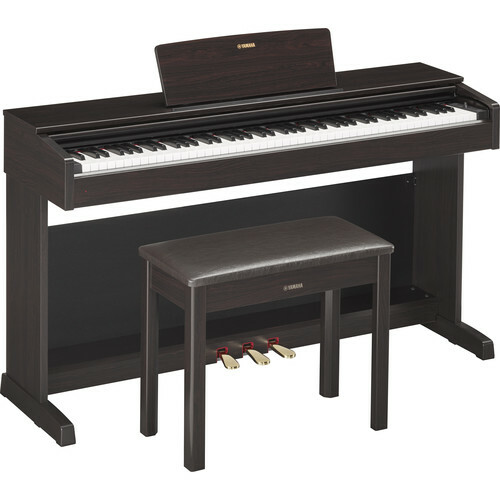 Box Dimensions (LxWxH) 55.0 x 22.0 x 17.0"
Arius YDP-143R Digital Piano with Bench (Dark Rosewood) is rated 5.0 out of 5 by 4. Rated 5 out of 5 by Anna from Great choice I was deciding between acoustic instrument and digital one for months. Finally I made my choice and I'm happy with it. I'm not a pro and for my purpose I don't need anything better. The sound and the feeling of the keys are very nice. I love it. Rated 5 out of 5 by David from Wonder YDP 143R What is GREAT digital.? Weighted keys are the key plus just a pleasure to play. Rated 5 out of 5 by Oliver from I do like this . I love Yamaha EP YPD 143R. It is pleased to me. Can it be shipped to a different address nearby in york county pa ? and is it tax free to pa ? We are able to ship Yamha products Domestically. If you need to modify a current order please email sales@bandh.com or call 800-606-6969. B&amp;H currently collects Sales Tax on orders shipping to adresses within NY, NJ only.